Please try to find something similar in the whole internet. I would like that you can see and interact with our works by yourself. But we are many miles away, and sometimes in your antipodes. Hence I put in my listings high detailed photos, explanation videos and. If nevertheless you have any question, please no doubt in contacting us. All our items are designed and totally made by us using. High quality materials and many hours of painstaking work. So they are practically unique and we have a very limited. This description and listing is for the model of the photos. We are working in new different models. We have more photos of our works on pinterest/mcplanetariums. We will update photos and videos as soon as possible. Thanks in advance for your visit. 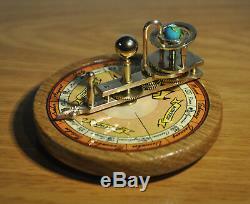 Brass & wood miniature orrery. 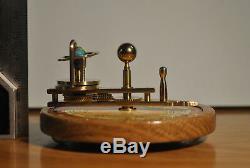 Brass & Wood miniature orrery series - YouTube. 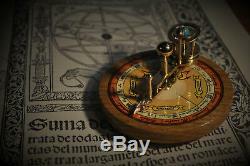 The first video describes the features and use of this orrery. The second video displays some other similar models. If the link doesn't work you can visit my youtube channel Micromechanical Creaturae. This planetarium is an original work inspired by old similar creations, specially in the exceptional James Ferguson's "Mechanical Paradox Orrery" model of 1764, but designed in a different and unique way with its own gear calculus according to the dimensions of the model. It is totally full working. This model is hand made and mounted with the maximum care one by one. This is not a mass produced item repeated thousand times. It is our own design and it is totally made by us. 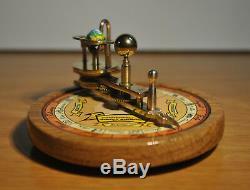 Features: This is a special type of orrery that describes the continuous motion of the Moon orbit and the reason of the eclipse cycles. It is probably one of the smallest working planetaria whith this features. Instruction and use: Usage is quite simple. 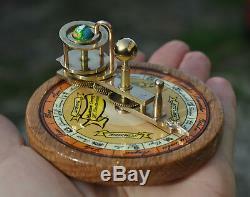 Video above ilustrates how to use this orrery. 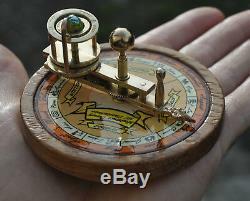 By turning counterclockwise the mechanism holding the knob next to the pointer, you can see how the orbit of the moon rotates changing its relative inclination showing a retrograde motion and how the point of apogee rotates too continuously with their real mean motions while Earth maintains its axis tilt in the same orientation thro ugh th e year. It demonstrates some facts about the Earth - Moon system: The seasons of the year. In the summer solstice, the tilt of the Earth axis produces the summer in the north hemisphere and winter in the south one. If you turn the pointer to the winter solstice you can see that the Earth axis tilt maintains its angle around the turn and now it is winter in the north hemisphere and summer in the south hemisphere. An eclipse season is one of only two periods during a year when eclipses can occur, due to the orbital iclination of the Moon. In this planetarium the Moon orbit is represented with a ring that have engraved both the ascending (north) node and the descending (south) node. When the nodes are aligned in the same line of the Earh and the Sun, eclipses can occur if in this period the Moon is in new moon (solar eclipse) or in full moon (lunar eclipse). You can see how this possibility occurs by turning the pointer. This ring rotates in the correct ratio of 18,6 years turn. 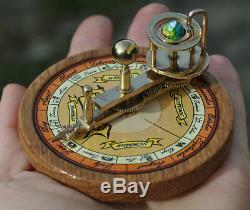 The direction of the movement is retrograde respect of the Moon- Earth movement around the Sun. The advance of the Lunar Apogee. 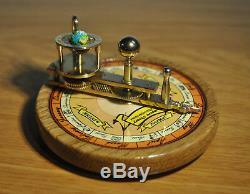 The lower base with the bronze pointer demonstrates the eccentricity of the Moon orbit. The pointer display the point of the apogee and it is easy to see its movement in the zodiac ring that surrounds the Earth. When the pointer is aligned between the Earth and the Sun and a node determines the possibility of a annular eclipse but if it is in the other side, the eclipses will be total. When the pointer is opposite to the Sun it is possible to occur a supermoon in a full moon. This pointer moves in practically the correct ratio. It rotates in advance one turn in approx. Dimensions: This is probably one of the smallest full working planetariums of the world with this features. All this is condensed in a 8,5 cm diameter round table and 4,5 cm approx in height. It fits anywhere by its exceptional size and it is an authentic eyecatching. If a special collector item is what you are after, this is a must. 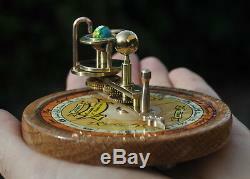 The materials: The mechanism is made of solid brass. Apogee pointer and axis are in bronze. Sun is in goldplated stainless steel. All the gears are made in a manual vertical milling machine with a manual indexing head. It is designed to last without practically any mecahanical maintenance. The brass is polished without any coat. Over time it acquires a museum like look. The table is made of solid Oak wood hand turned and varnished in natural tone. It has a steel ballast inside to assure stability when turning the mechanism. It is coated with several protective coats of varnish. The Earth globe is hand painted with high detail including the real polar ices. It is 8mm in diameter. It is carefully made in ABS by high quality 3d printing procedure and hand finished. The dial is a high quality print with our original design that depicts the month, the seasons of the year and the zodiac. It is protected with several coats of varnish. Sorry if I have bored you. There is a link for the video at the top of the page. Decorative elements apart of the orrery are not included. Real colors may vary depending of devices or screen configurations. This item is not a toy and is not intended for children. Si es usted de España necesitaré obligatoriamente sus datos completos incluyendo DNI o CIF para formalizar la factura. 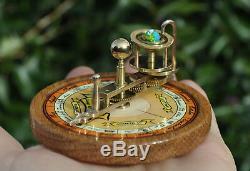 The item "Solid Brass and Wood Miniature Orrery Paradox Earthglobe Planetarium Astronomy" is in sale since Thursday, March 28, 2019. 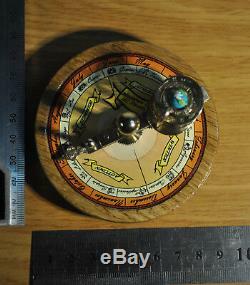 This item is in the category "Collectables\Scientific Collectables\Scientific Instruments\Other Scientific Instruments". 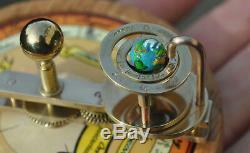 The seller is "mcplanetariums" and is located in Colindres , Cantabria.